Students from the Latino Student Union, along with psychology and Spanish majors, gather at the CHSS display. 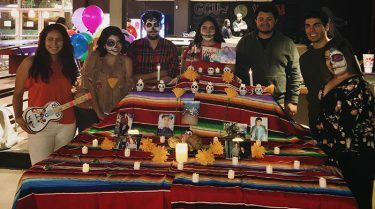 Thunder Alley was packed Thursday night as hungry students dined on tamales and flautas and watched the film “COCO,” the story of a boy who visits the Land of the Dead in a desperate attempt to defy his family’s traditions. 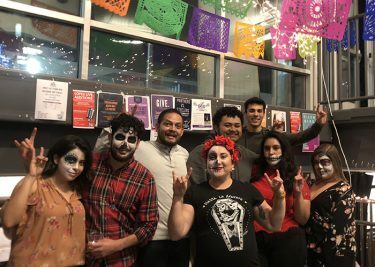 For Latino Student Union president Leonardo Quintero, the dynamic event was all about presenting Mexican culture to the Grand Canyon University student body and implementing it into the culture of the Lopes. 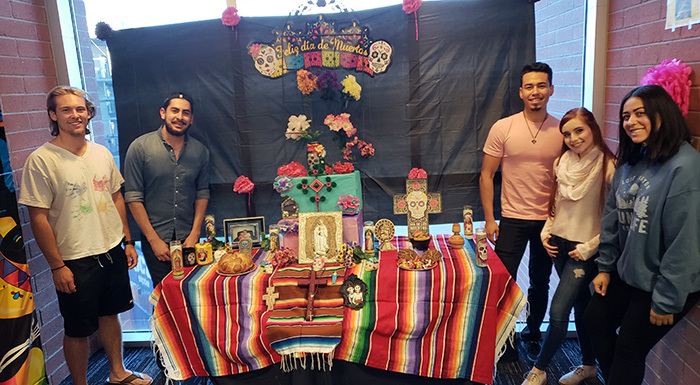 Those goals continue today in the lobby of the College of Humanities and Social Sciences building, where CHSS Assistant Dean Dr. Noé Vargas and his staff have configured a Day of the Dead display, translated as Día de los Muertos in Spanish. LSU officers from left, Jessica Guillen, Selene Ramirez, Hector Lizaola, Christina Montano, Leonardo Quintero, Xavier Cardenas and Jazmine Fraide. While there are many dearly departed Vargas reflects upon, including his parents, his grandfather, Jose González, was foremost on his mind Friday morning. Vargas is hopeful that when students, faculty and staff stop by the display they will gain a deeper understanding of Día de los Muertos. “Learning about other cultures only helps you understand each other better,’’ he said. As part of the two-day event, Vargas attended the Spanish showing of “COCO,” along with approximately 250 students, faculty and staff members, and their families. It was followed by the English language viewing, which drew approximately 200 students, faculty and staff members, and their families. Members of the Latino Student Union were strongly represented. From left, LSU officers Selene Ramirez and Hector Lizaloa, Thunderground manager Daniel Sabillon, advisor and Student Conduct Coordinator Kayla Fonseca, LSU officers Leonardo Quintero, Christina Montano, Jazmine Fraide and Xavier Cardenas. The support of GCU’s Canyon Activities Board (CAB) has been instrumental in the growth of the club, which made the event special via decorations and delicious dishes, including arroz con leche (Mexican rice pudding), chocolate abuelita (Mexican hot chocolate), pan de muerto (“dead bread,” a type of sweet roll), and conchas (shell-shaped Mexican sweet bread), along with the tamales and flautas. Quintero, a senior from San Diego majoring in Information Technology with an emphasis in Cyber Security, was thrilled to see people young and old, come together to remember and to celebrate.